Climate change demands a change in how we envision, prioritize, and implement conservation and management of natural resources. Addressing threats posed by climate change cannot be simply an afterthought or an addendum, but must be integrated into the very framework of how we conceive of and conduct conservation and management. In Climate Savvy, climate change experts Lara Hansen and Jennifer Hoffman offer 18 chapters that consider the implications of climate change for key resource management issues of our time—invasive species, corridors and connectivity, ecological restoration, pollution, and many others. How will strategies need to change to facilitate adaptation to a new climate regime? What steps can we take to promote resilience? Based on collaboration with a wide range of scientists, conservation leaders, and practitioners, the authors present general ideas as well as practical steps and strategies that can help cope with this new reality. While climate change poses real threats, it also provides a chance for creative new thinking. Climate Savvy offers a wide-ranging exploration of how scientists, managers, and policymakers can use the challenge of climate change as an opportunity to build a more holistic and effective philosophy that embraces the inherent uncertainty and variability of the natural world to work toward a more robust future. "In this no-hype, no-nonsense guide, the authors clearly and eloquently explain why and how strategies for conservation must be transformed to cope with our inevitably changing climate. This book should be mandatory reading for anyone who cares about and plans for our planet's future." Nancy Knowlton, author of "Citizens of the Sea"
"Adaptation to climate change is not a cop out; it is a necessity. Thousands of species and many distinct ecosystems are threatened by changes happening too quickly across fragmented landscapes. Either we leave it to the engineers, developers, and politicians to figure out how to protect property values during this mess, or conservationists must work with society to help nature, as well as humans, adapt. 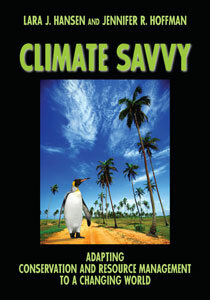 Climate Savvy offers excellent guidance in this direction." "As our world transforms by climate change into a psychedelic nightmare, Climate Savvy provides a solid guide for conservation. This is a handbook for the changing future, grounded in science and deeply practical. It will be essential reading for any planner, manager, or environmentalist." "The 'tao' of adaptation is introduced by Drs. Hansen and Hoffman (Buying Time: A Users' Guide to Building Resistance and Resilience to Climate Change in Natural Systems), among the founders of EcoAdapt, a nonprofit organization working on ecosystem-oriented climate change adaptation strategies." "In short, this is a useful handbook for helping resource managers realize some of the challenges that they will need to address in the coming years." "Climate Savvy is a timely publication. It is a guide to robust decision-making for everyone from Landcare groups to policy-makers." "This book can help managers grasp the breadth of issues related to climate change that are relevant to conservation and management and behind thinking creatively about the future."